Dock Diving. For pups who live near the water - or can be transported to it - this doggie sport - because it is a real sport - can provide them with endless fun and exercise. While not every dog is a water baby , many are and they get truly excited about the idea of running and jumping, splashing around and then getting tons of praise from their pet parent. One of the most important dog dock diving equipment is the toy chosen for your pup to catch. But how do you determine just which one to train with? What are the best dog toys for dock diving? Read on to discover more about the best dock diving dog toys so that you can make the best shopping decision for your playful pupster! Despite the slightly morbid name, this dog toy is a big hit with pet parents whose pups take their water training seriously. Originally designed to help train hunting dogs the fact that it is very durable and can float has made it popular with dock divers as well. As the name suggests the toys resembles a (flat) dead duck (you can actually purchase several different 'species' of duck) It is crafted from a lifelike waterproof foam and its weighted 'hanging' head mimics the weight of a real bird of the same size (approximately ten inches). It can also be injected with a special scent (sold separately) to make the training sessions even more realistic. Many of the pet parents who have purchased this toy for water training purposes state that while they rarely make use of the scent feature - that really is geared more towards hunting dogs - they do like the fact that the duck 'flies' well when thrown and is very durable . Most do caution however that this Mallard duck toy is strictly a training toy and should never be left with a dog unsupervised as it does not stand up to a great deal of aggressive chewing. This is another very colorful toy that can be used in all kinds of dock diving situations, from simple play to training to competition, but only for a small/medium dog, as larger dogs were reported to make very short work of it and for them, it was not the most durable choice and did not last long at all. The KONG Water Wubba floating dog toy is very lightweight, which is great for distance throwing but it does not float well, something that some pet parents found to be very disappointing. However, some felt that for their smaller pup it was just the right weight and size to use for practice purposes. The Chuckit! Tumble Bumper looks very simple, but looks can be deceptive. Its rectangular shape and bright colors make it the perfect toy for interactive play and a great choice for dock jumping. It is designed to be 'high float', making it perfect for water sports and its multi-layer construction is designed to make it more durable and better able to stand up to chewing and tugging. 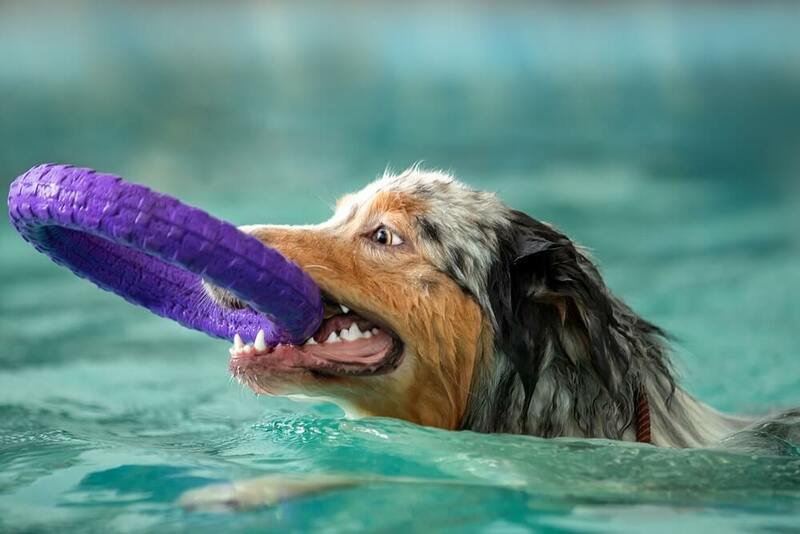 Most pet parents who have purchased the Chuckit' sport dog bumper have found it to be a great practice toy for dock diving and its floating abilities -combined with its high visibility - means that it is hard to lose, which is always a plus. Some do caution that it is best not to leave it sitting in the very hot sun for too long though as that seems to 'melt' its outer layer. This retriever bumper toy is specially shaped to fly through the air with more speed and accuracy, so that does help it serve as one of the best jumping dog toy. Its three bumper nature makes it not only easier to throw but easier for dogs to catch as well, as it gives them three points of possible contact. The bright colors featured on every Chuckit! Tri-Bumper Dog Toy makes it easy to see and easy to find - for both dogs and their hoomans, and it floats well in the water. It is soft and easy on a dog's sometimes sensitive gums. Pet parents like this toy because when thrown it achieves great velocity and height and, provided dogs are not allowed to use it as a chew toy, it is very durable as well. The one comment that is commonly made about this dog toy is that it is not a chew toy, and if left unattended with a dog who likes to chew it is not likely to last for very long. It should be noted, right from the start, that this is not a dog toy that is designed to go in the water. Its squeaker and construction can become damaged if it is exposed to water for too long. Therefore you may be wondering why it appears on a list of the best dog toys for dock diving. The simple reason is that this is a great on land training toy for pet parents introducing their pups to more accurate catching. Very few dogs become accomplished dock divers without a considerable amount of land practice, and that, many pet parents say, is exactly what the KONG Jumbler Ball Dog Toy is perfect for. The fact that it also contains an extra ball in its interior, and that it squeaks when shaken, makes it more engaging for dogs, often meaning that they are more likely to be keen to retrieve it. Will this football-shaped toy help your dog learn to catch like an NFL wide receiver? That may very well depend on the level of your pup's skill - and your ability to throw like a quarterback - but its shape is obviously great for help to ensure that it flies through the air efficiently and effectively and achieves some nice height at the same time. The KONG Jumbler Football Dog Toy is crafted from a durable rubberized plastic and although it can stand some exposure to water it is not designed to stay there for too long, so again this would make a better land training toy for the budding dock diver than one for use in the water itself. The one skill that the KONG Jumbler should help improve is that off actually keeping the toy in the mouth. In many dock diving competitions that is a must for any pooch to score points, and the small handles that are built into this ball do, many pet parents say, makes it easier for pups to catch and grab. Before they can ever be trained to dock dive properly a dog has to be interested in the idea in the first place. while most pups will play catch for a while many lose interest rather quickly and prefer to change the game themselves and go looking for their favorite chew toy instead. The Pet Qwerks Talking Babble Ball Dog Toy - while certainly not for use in the water because of its electronic components - is designed to make the game of catch more engaging for dogs because this ball actually 'talks' to them as they play with it. It can 'say' 20 different things, in different tones of 'voice' , something that lots of pups find both engaging and amusing. Pet parents who have purchased this dog toy praise it for its ability to keep even skittish dogs engaged for longer periods of time and also for its relatively good durability. The one thing that comes up over and over again in reviews, however, is just how much the dogs love to play with the ball, and many will amuse themselves for hours with it alone. Heading back to dog toys that are designed for use in the water, the Chuckit! Ultra Rubber Ball Dog Toy is another very good, and very popular choice. The tennis ball like construction makes it much easier for many pet parents to throw with accuracy while also being easier for most dogs to catch. The Chuckit! Ultra Rubber Ball Dog Toy comes in a choice of bright colors and sizes and floats well, meaning that it is easy for both dog and human to spot should the catch portion of the exercise fail. It is also very durable, and isn't easily pierced, even by the sharpest teeth, a definite bonus if your pup is going to be catching it over and over again. Those who have already purchased one of these toys praise it for its durability and its ability to travel longer distances when thrown. Or, as one pet parent put it, you don't have to have the pitching skills of Nolan Ryan to make a throw that is far enough and high enough for a dock diving dog to catch at just the right distance. If you are new to this canine sport and want to learn more about how your pupster can participate in it check out the North American Diving Dogs (NADD) which was formed in 2013 and works to develop dog dock jumping into one of the fastest growing canine sports. 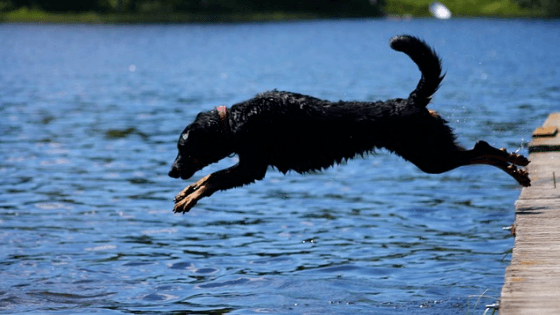 Although the concept of a great game of catch and fetch with your furkid is far from new - people have been tossing balls to their pups for centuries - as a formal 'dog sport' dock diving is a fairly recent phenomenon. Dock diving or dock jumping is perhaps one of the best interactive dog games out there for your pup and it's hooman! The actual point of dock diving competitively is how high and how far a pup can jump after launching itself from the dock. But unlike human divers dogs do need some extra motivation to do that - they really don't get the concept of gold medals and trophies - and that is where the best dog toys for dock diving come in. The dock toys that we have already mentioned are certainly some of the best options out there but there are more. So how do you go about choosing the right dock diving dog toy for your UNIQUE furkid? Here are some basic pointers !! As we mentioned, dock diving dog breeds such as - Golden Retrievers, Labs, Australian Shepherds, Portuquese Water Dogs, Poodles, Newfoundlands - do need some motivation to launch themselves into the water from a height. And while good training and a great rapport between dog and owner help a lot, the right toy will help even more. One of the difficulties here is different dogs are motivated by different toys. Some, often those who have 'hunting genes' in their blood will be most excited to go after 'an animal', one of the reasons why the decoy duck type toys are a very popular choice among some dock diving teams. Others, perhaps those dogs that love chasing balls on dry land, are actually better motivated by a simple ball, as long as it can fly high and far enough to catch their attention. This does mean that many pet parents find there is more than a little trial and error involved in finding just the right toy for their pup. Fortunately, as most of these toys are relatively inexpensive doing so is not too much of a strain on the pocketbook. Most serious dock diving dogs train on both land and the water, and those two different locations may call for different toys. On land it may be more important that a toy keeps a pup engaged and prevents them from walking away from a session out of boredom while out on the water it is likely that the most important thing is that the toy be easy for a smart dog to spot and track and that it is lightweight enough to travel longer distances in the air. 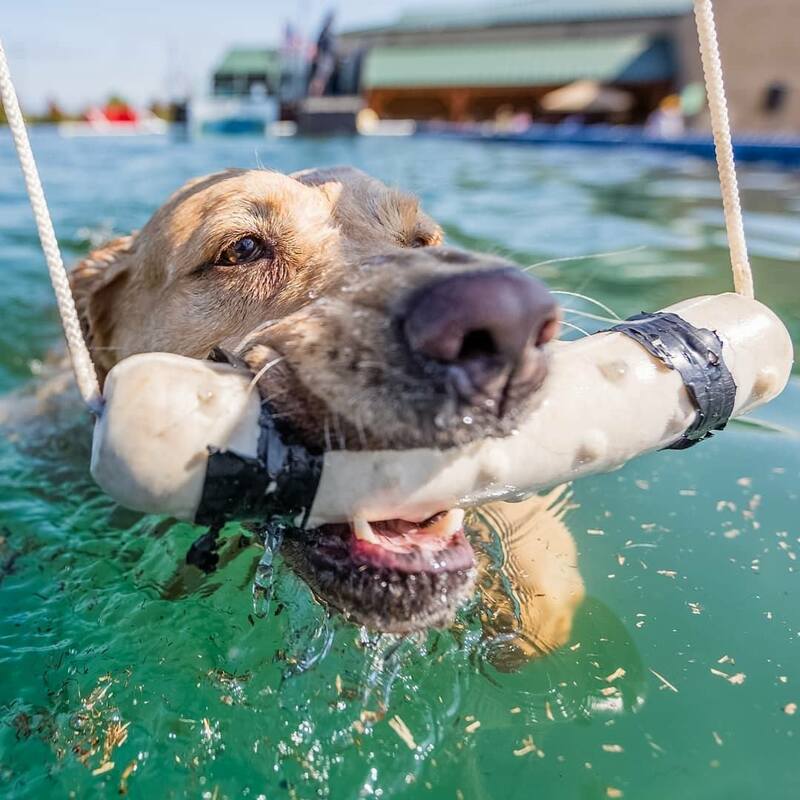 One tip here from dock diving trainers whose pups are pros: Once you find the water toy that motivates and excites your sporty pal the most, stick to it and ensure that it is only used for dock diving and nothing else. This, the pros say, helps establish its purpose in your dog's mind and help keep him focused on it when he is supposed to be. What Are Your Dock Diving Plans? Dogs don't have to compete to get a lot out of dock diving. It's actually something that is naturally a lot of fun for most pups, and so simply getting out to the local lake and having fun with their pet parents is more than enough to satisfy many pups (and their hoomans)!!! If those are your plans then when buying the best dog toys for dock diving you should stick to finding out which toys your pup simply has the most fun with, the ones that really get him excited about making that big leap. On the other hand, if you want to get serious about dock jumping competitively things change quite a lot. Like any athlete, the best dock diving dogs train a lot, and the best training toys help them improve in leap and bounds (pardon the pun). In these situations making the investment in 'serious' dog dock diving toys like the Dokken Dead Fowl Trainer and the Nerf Dog is often the best course of action and, as we have already mentioned, ensuring that those toys are only used for water play. Choose a brightly colored toy, it'll be easier for you and your pup to track down! And most importantly, choose a toy that you can both have fun with, as that really is the point of a canine pastime like dock diving after all! !